Instructor User Guide ForumsHow do I move a thread to a different topic? This option allows for a thread or conversation to be moved to a different topic. The topics will be listed underneath the corresponding forum in smaller, bold font. Click on the topic containing the item to be moved. Check the box next to the conversation to be moved. All conversations, or threads, will be listed. After selecting move threads, a box will open with options pertaining to the thread and where it will be moved. Select options and click Move Thread(s) to the selected topic. The available topics will be shown. 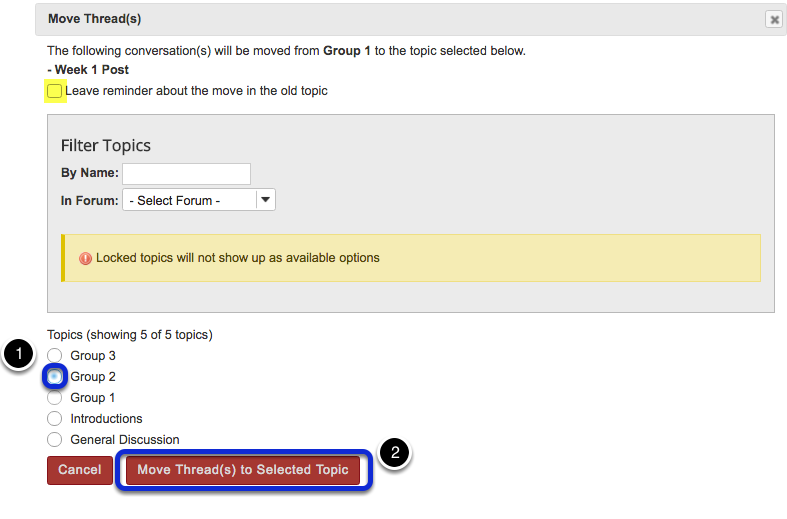 Select the topic where you would like to move the thread. Click Move Thread(s) to Selected Topic to continue. Tip: You may optionally select the check box to leave a reminder about the move in the old topic. Prev: How do I grade discussion forums? Next: How do I delete a topic?